Mike Gleason: The dollar has obviously been a very big headwind for the metals of late. In a recent article of yours  that I was reading you implied that the powers that be are propping up the dollar and coming in to save it right when it's on the verge of potentially breaking to the down side. Give us your thoughts there. Ed Steer: Sure. Just google my name, Ed Steer. And my website is EdSteerGoldAndSilver.com  and they can read the sample column that I have provided for free and they can decide whether my service is worth $100 a year for 200+ columns. Mike Gleason: Well that will do it for this week. 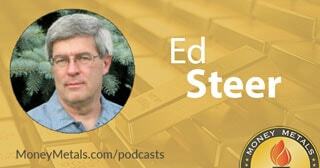 Thanks again to Ed Steer, director and board member at the Gold Anti-Trust Action Committee  and also the purveyor of Ed Steer's Gold and Silver Digest. Again, check out EdSteerGoldAndSilver.com  for more information. He publishes a lot of great content there and covers the metals markets very closely. And we highly recommend everyone check that out. Mike Gleason is a Director with Money Metals Exchange , a national precious metals dealer with over 50,000 customers. Gleason is a hard money advocate and a strong proponent of personal liberty, limited government and the Austrian School of Economics. A graduate of the University of Florida, Gleason has extensive experience in management, sales and logistics as well as precious metals investing. He also puts his longtime broadcasting background to good use, hosting a weekly precious metals podcast since 2011, a program listened to by tens of thousands each week.